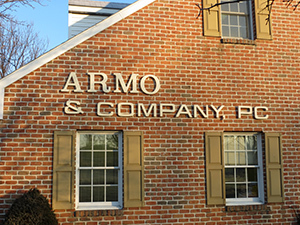 Armo & Company, PC has been a member of the professional community since 1960. Although our address and our name have changed since our founding, we have always been a Berks County firm. We take seriously our role as a responsible corporate citizen and encourage all of our employees to be active in the community. Today, the Firm is a full-service CPA firm with expertise in auditing, reviews, compilations, taxes, payroll preparation and reporting, QuickBooks training and consulting, controller by the hour services, mergers and acquisitions and management advisory services. Our clients, in addition to individuals, are a blend of small, medium and large size businesses and professional firms representing a wide variety of fields, including: healthcare, light manufacturing, leasing, transportation, "hi-tech" industries, wholesale/retail trade, not for profit and construction.